The story of a girl growing up in Iran, based on the autobiographical comic book by Marjane Satrapi, showing us the evolution of the Persian / Iranian society and her family’s personal experiences with suppression and democratization, communism, incarceration and silence … I am having a hard time describing the historical background, as I do know so little about it. For me, hence, the film was a little bit of thrilling personal story of this girl and woman torn between her Iranian home and her European exile, but in particular a terribly interesting lesson in regional history. 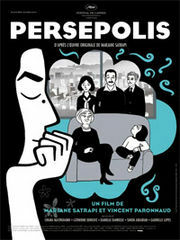 The main character is absolutely charming, witty and energetic, and the form of narration, the very original graphical style, mostly in black and white, adds a certain dreaminess to the film and detaches it from its historical roots, making it a universally applicable allegory about growing up, being political, losing family, losing and gaining hope and loved ones. All in all, one of the most fascinating and most beautifully narrated films of the last couple of years.